X is one of our favorite punk bands of all time. Definitely top 10 and maybe top 5. 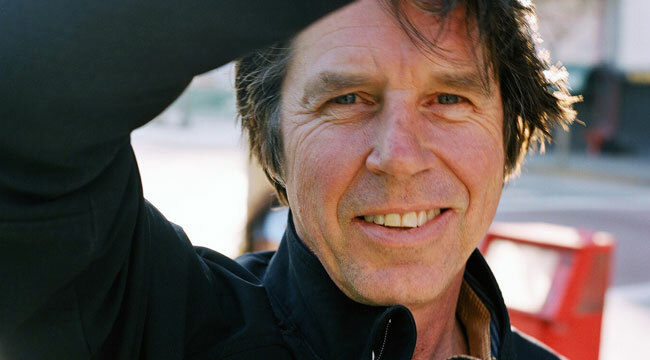 So when X singer-bassist John Doe puts out something new, we take notice. Doe has been recording as a solo artist for 20 years now. Due out Aug. 30 on Yep Roc, his eighth solo effort, Keeper, is another terrific album that blends his punk rock roots with his current alt-country inclinations. We recently had the chance to interview Doe for an article for Hearsay Now and Amped, two industry music mags published by our friends at Alliance Entertainment. We called him at his Marin County California home and spoke for a good 20 minutes about his new album and his current state of mind (turns out the guy’s in a good place). He was super nice, and we discovered we shared an affinity for the indie rock that emerged from Tucson in the late ’80s when Giant Sand and Rainer were active on the scene. Here’s an excerpt from our conversation. You embarked on a solo career back in 1990. What was it like first going out on your own and how have you been able to balance your solo career with your many other projects? Wow. That’s a far-reaching question going back 20 some years. I started doing solo stuff in 1986/87 and given the opportunity to do a solo record I took advantage of it. If someone says, “Write a book on a subject you love, how about it?” You say, “Why not?” I’ve played X songs and folk songs and Country Western songs from that point on. I would have to say the first solo record was marginally successful but certainly not successful in the eyes of the great and powerful Geffen Records. I spent a lot of money making that record, and they were happy to write several checks for tens of thousands of dollars. It’s a good learning experience. It got way overproduced and taken out of my hands because I didn’t really know exactly what I wanted. Maybe two records later, I started to realize that I did know what I wanted, and I wanted was less orchestration. Less is more. I wanted fewer instruments and more emphasis on the performances that were there. I wanted to balance that with playing in X, playing with the Knitters and doing records with Jill Sobule and the Sadies. It’s a matter of blocking out time so you can pay attention to each one of those projects. I want to talk about your new album, but could you first talk about X. What is it that keeps that band going? The maintenance on X nowadays is pretty low. We still love it and still play well. [Singer] Exene [Cervenka] and I write songs together, but they don’t seem to be X songs. I’m not sure people want to hear a new and different X. If we made an X record now, it wouldn’t be the same 1980s punk rock. It’s not 1980, and we’re not punk rock songwriters. Your solo material has always leaned in more of an alt-country direction. Did you always have an interest in country music or did that come later in your career? I think it came a little bit later but it’s the kind of music I can do and sing. I don’t know where that influence came from except that I’m a white guy and I grew up listening to that stuff. If I tried singing R&B, people would laugh at me. And I don’t need that. So I think it was something I heard when I was younger and just gravitated towards. Doing that Country Western covers album with the Sadies must have been a rewarding experience. It was a real treat. It was a gift that they wanted to do with me. It was exciting to be able to sing and make a record with those kinds of songs, which are great songs from the Country Western catalogue. We thought it might be our only chance so we didn’t want to do obscure ones. We wanted to do ones that are fairly well known and are real hits. You’ve said you wrote the songs on Keeper with the late ’60s and ’70s in mind. Talk about how that time period informed the album. Well, I think that was a point in musical history and in my musical education when I decided that was what I wanted to do. I learned to play bass and write songs listening to that era of music. As a songwriter and musician, you can draw from those influences. You have to make your own way and develop your own style and you put those things to the background and use it as influence and not as a direct style. In working on these songs and the melodies and chord changes and stuff like that, it seemed as though that era of music was more present in these songs. [Producer] Dave Way and I have worked on several records together and we decided to use the songs as jumping off points. I read that you were trying to write some happy songs this time around. Does “Don’t Forget How Much I Love You” qualify as one of those? Oh yeah. It’s not trying to. It’s learning how to. It’s learning how to write something that’s positive about love rather than longing or negative and not have it be sort of stupid or lame. What inspired that shift in your thinking? Talk about some of the musical guests on the album. It’s a good cast of people who contribute. Smokey Hormel is someone I played with years ago. We played together for about four or five years, and he moved to New York and was playing with Beck and Johnny Cash and Tom Waits and all kinds of people. He happened to be in L.A. when we were recording. He and Don Was, whom I’ve know forever, were both available. As was Jamie Muhoberac, who I’ve made about four records with. He does all kinds of studio stuff. He did the album version of Rent. He worked six months on that, playing all these different synthesizer parts. He’s an incredible player. He’s a session guy. For “Lucky Penny” and “Giant Step Backward,” my girlfriend and I were talking about having a female singer and she suggested Patty Griffin, who I’m a big fan of. She was available in New York. It was one of those kind of Hollywood things. She was doing two nights with Robert Plant and she had a day off and I booked a studio and she sang these two songs in about an hour and just knocked them out. It was a miracle of scheduling that she happened to be there and I happened to be there. Jill Sobule and I are great old pals. We made that record A Day at the Pass, which came out about sixth months ago, and she is one of the most fun-loving and wonderfully creative songwriters and lucky for me, a great friend. Cindy Wasserman and I have been singing together for seven or eight years now. I think Giant Sand’s Howe Gelb is on it, too. Yes, I sent him some tracks and he put his wild piano playing on a song. One of these days, I’m going to make a whole record with Howe Gelb. I’m going to go to Tucson and we’re doing to sit and write and sing a whole record. It’ll be great and crazy. Howe Gelb is huge in Europe. It sounds like one of those clichés, but he really is. People just don’t get him here because he is too eccentric. He’s like the Tom Waits that people didn’t quite get. You’re approaching 60. Talk about how you see the rest of your musical career going and whether you ever think of retiring. Uh, no I don’t think about retiring. You don’t have to push me toward that 60-year-old mark. I still have a few years before I get there. I don’t have any grand plans. My personal life is at a much better place than it has been in a long time and my health and children are good. That can only lead to a longer, more fulfilling life. Figuring out how to write a song that’s fairly satisfied or happy is a good thing rather than constantly being angry. It’s never going to be soft or weak, but I think there’s something to be said for being satisfied. Who knows, maybe when I’m in my sixties I’ll be able to do some old man acting parts. Some people seem to do well as older actors.